eSports is the fastest growing sector of competitive play in the world. In 2014, eSports boasted 205 million participants and viewers and that is growing by 21% a year. By 2015 the League of Legends championship viewership exceeded that of the Stanley Cup Playoffs. 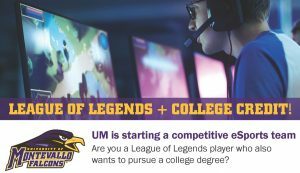 We believe offering a competitive eSports platform at UM allows students who are passionate about gaming a great opportunity to pursue their goals and degrees simultaneously. UM is starting a new competitive eSports team in the Fall of 2019. We are currently recruiting League of Legends players who are looking to achieve a college degree while pursuing their passion of competitive gaming. The goal is to field a varsity team that will compete not only in one-off tournament play, but also within conference play against other colleges and universities. Dr. Brendan Beal serves as the Key Advisor to the UM eSports Team. He has spent the last five years in eSports as a DOTA 2 player and consultant on the pro-amateur circuit. He has passion for games and has attended The International (the biggest prize-money of any eSports tournament in the world) the last two years. 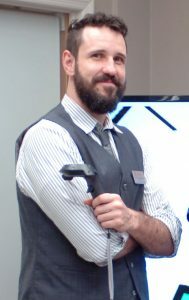 He hopes to provide the chance for students to compete, learn team-building skills, and earn a college degree while playing the games that they love. Can I receive scholarship funding if I earn a spot on the UM team? Scholarship funds may be available for competitive players considering both their position on the eSports team and academic achievement. More details will be released soon. Is League of Legends the only title UM will play? No, the eSports development team is actively considering other titles from which to field varsity teams. Your participation by filling out the interest form here will assist us in selecting those titles. Will the team have a coach? Yes, the plan is to have coaching for the eSports team available for play starting in the Fall of 2019. More details to be released soon. Will I be a part of the athletic community as an eSports team-member? Yes, eSports is governed by the NACE, which UM plans to participate in, not the NCAA. However, UM will likely position eSports within the department of athletics, along with other NCAA Division II sports. I am interested in learning more, how can I get in touch with the eSports development team? You can fill out the eSports recruiting interest form here: eSports Interest Form. Also, you can apply to the university or schedule a visit by clicking the buttons at the bottom of this page.